Fun with bubbles! 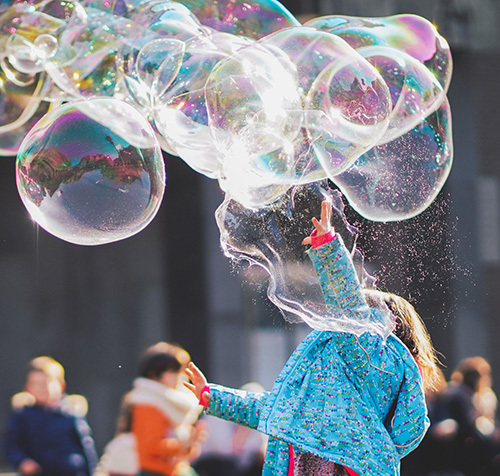 For outdoor parties, our Bubble Expert and their handler will put on a spectacular bubble show, and then invite the kids up for an interactive segment in which they can create bubbles large, small, and every size in between! PLEASE NOTE: these are meant for off-site, outdoor parties ONLY – rain or shine. For indoor events, please call to inquire about show modifications. Fun 1 to 2 inch sparkling designs, many to choose form. Select your design, glitter colors and add some sparkle to your event. Tattoos last for up to 2 weeks with proper care. Great option for pool parties. Large parties may require additional time. Close in look but without the pain—Airbrush Tattoos are a real hit at parties and events — we will bring many designs to choose from. Tattoos are applied with an Air Brush system using all cosmetic grade inks. Tattoos last 10-14 days. Great for kids and adults! Per hour (approximately 20 tattoos) $125, 100 each additional. As an add on $85 per hour. Opening presents is an activity that is pre-planned within our party structure. If you choose not to open presents it will become necessary to “fill” that time with a fun, simple additional project! Projects will be determined based on party guests ages and gender — we will choose something that best fits your guests! $25 per 10 guests $2 each additional. Additional time in our party room is available at $45 per half-hour. Additional time must be reserved at time of registration.